Each gospel in the Leiden manuscript opens with two illuminated pages built up with decorative elements and letters. 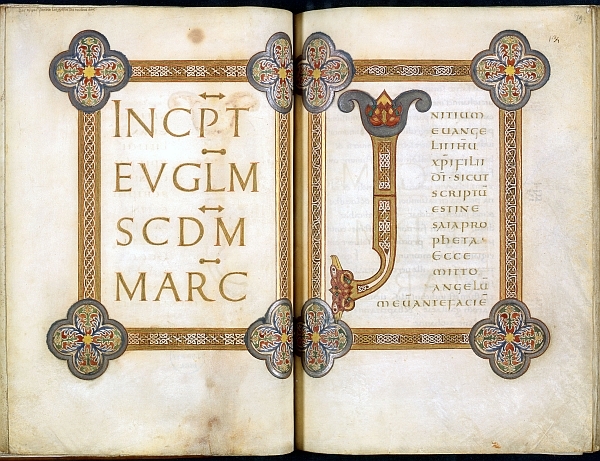 This beautiful gospel book dating from the second half of the ninth century unites the Latin gospels by Matthew, Mark, Luke and John in one binding. The medieval gospel books used in liturgy often contain impressive examples of illumination (and were sometimes set in a ‘treasure binding’, with silverwork and precious stones). The Leiden manuscript (now in a modern binding) belongs to a group of about twenty ninth-century gospelbooks with a common origin, designated by art historians as the ‘Franco-Saxon school’. This name indicates that these codices on the one hand have been written in a Caroline minuscule — the script from France that spread across Europe in the course of the ninth century — but on the other hand have illustrations that are clearly influenced by illuminated manuscripts from the Anglo-Saxon tradition. Presumably, the centre of this school is the scriptorium of the Benedictine abbey of St. Amand in Northern France. Each gospel in the Leiden manuscript opens with two illuminated pages built up with decorative elements and letters. The digital image shows the beginning of the Gospel of Mark. The title is written in square capitals (fol. 78v): INC(I)P(I)T EV(AN)G(E)L(IU)M S(E)C(UN)D(U)M MARC(UM) - Here begins the Gospel according to Mark. The beginning of the gospel text (fol. 79r) is written in uncial script: INITIUM EVANGELII (IESU) (CHRISTI) FILII D(E)I . SICUT SCRIPTU(M) EST in ESAIA PROPHETA . ECCE MITTO ANGELU(M) MEU(M) ANTE FACIE(M) - The beginning of the gospel of Jesus Christ, the Son of God. Behold I send my angel before thy face. The interlacement in the decorated initial J and frames, and also the eight multi-coloured vignettes in the corners can be compared with contemporary jewelry, such as the 'fibula of Dorestad'‘, now kept in the Rijksmuseum van Oudheden (RMO, National Museum of Antiquities). This famous brooch was found in 1969 in a water well in Wijk bij Duurstede during excavations in the medieval city of Dorestad. The decorated gospel book and the fibula — made of gold and inlayed with different colours of glass (forming volutes and two crosses), four red semi-precious stones (designating the four evangelists?) and edged with pearls — show artistic affinity. As of 1 August 2009 the Leiden gospel book will be exhibited in the RMO. For three months, book and brooch can be admired side by side in the ‘treasure chamber’ of the Dorestad exhibition.